DISCLAIMER: I am not a doctor and I don’t even play one on TV. I do not recommend that you change your diet without first discussing it in detail with your own doctor. That being said, I encourage you to have that conversation and take full control of your food choices. Cherries (The Conscious Life) – Contains the antioxidant anthocyanins which is anti-inflammatory. Apples (The Conscious Life) – The apple skin contains quercetin which may protect the brain from Alzheimer’s. Whole Eggs (p192) – One of the best sources of choline which is essential for brain function. Choline helps synthesize acetylcholine which is critical for memory and thought. Seafood (p204) – Provides omega-3 fatty acids, choline, iron and iodine which are important for brain health. Fresh Vegetables (p255) – Antioxidants, anti-inflammatories which may prevent dementia, brain aging and Alzheimer’s. Also have fiber and many important vitamins like A, C and E.
Asparagus (The Conscious Life) – A great source of folate. 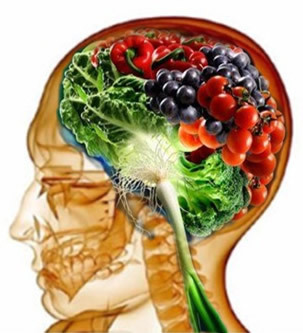 A recent study found that people who were folate deficient were 3.5 times more likely to develop dementia. Pomegranates (p246) – High in antioxidants and helps prevent fatty deposits from forming. Coconut Oil (Mercola) – Provides ketone bodies as an alternative fuel for the glucose-starved brain. Red Wine (The Conscious Life) – Contains flavanoids and resveratrol which increase cerebral blood flow. No more than a glass a day. Grape Juice (Medical News Today) – Similar benefits as red wine. 100% natural grape juice may lower or delay onset of dementia. Trans Fats – Found in packed baked and frozen goods, margarine, vegetable shortening, donuts, fried foods, chips, candy, pie crusts, muffins, pre-mixed cake and pancake mix, chicken nuggets. Red Meat – This is a bit controversial. Many would say lean read meats are healthy, whereas others would point to studies that show a strong correlation between red meat consumption and numerous diseases. I think the prudent choice is to limit red meat and opt for salmon or chicken when you can. Sugar – Sugar may be the most loved and over-consumed “toxin” on the planet. In general, you can avoid many of the “bad foods” above by avoiding fast food, fried foods, packaged foods and processed food. I took these from an email I recently sent to a friend. LUNCH OPTION 1: Rosemary or turmeric spiced salmon sandwich with spinach on whole wheat toast (you can buy salmon in a can like tuna-fish mix with some rosemary or turmeric and spread on bread with some spinach leaves). LUNCH OPTION 2: Rosemary or turmeric spiced egg omelet with flaxseed, red onions, peppers, mushrooms a little cheese and any other veggies you want to throw in. LUNCH OPTION 3: A green salad with apples or blueberries, veggies, shrimp, chicken or salmon, flaxseed and a vinagrette dressing. Go easy on the croutons and cheese, but you can put a little on for interest. Skip the bacon bits. This is a printable cheat-sheet I made for my friend to carry around. It is specifically targeted towards foods and activities which help prevent or slow the progress of Alzheimer’s. I’m going through this with my Mom right now 🙁 This is a very helpful summary, thank you so much for putting it together. I’m going to print and laminate the reminder card for her and Dad to reference when they are making food choices. God bless! Have you found the Greatest Foods book to be well organized? I have a different one but find it impossible to use as a reference. Any thoughts would be appreciated. 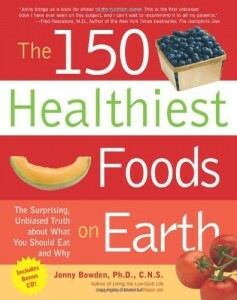 Hi BCH76, the 150 Healthiest Foods book is a great daily reference. I have bought a copy for probably 6 friends and family members and keep it in my kitchen for constant referrals. I love it. There is another one called “The 150 Healthiest 15-Minute Recipes” which I have and love, but don’t use as much as the first. Read about your hernia surgery (both before and after). Thought they were good posts. Now that I need the same, I THINK THEY WERE WONDERFUL!!! I live in Oxford (MA) and the doctors that I have spoken with at UMASS in Worcester seem to prove the old adage: “THOSE THAT CAN….DO! THOSE THAT CAN’T….TEACH! Beth Israel isn’t that far away. Any chance that you would share you surgeons name so that I could schedule an appointment?